Gather some friends, whip out your phone and get ready for laughs. 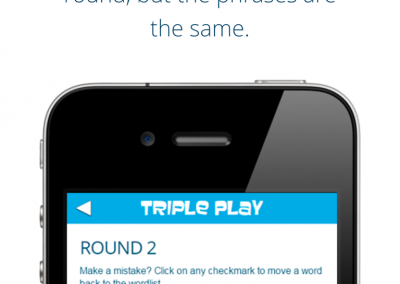 Triple Play takes you through three rounds of guessing games – each more difficult than the last. 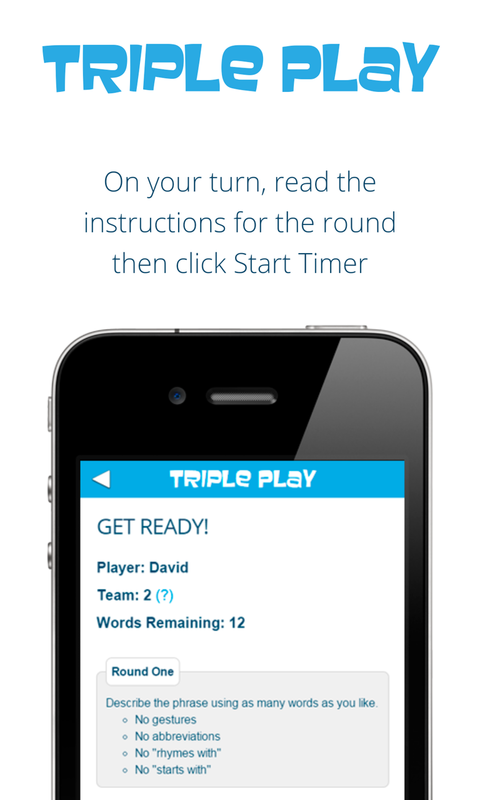 A great party game, Triple Play will have your friends stuttering and racking their brains for the right word to get your team to guess the phrase. Say anything you can to get your team to guess the phrase on the screen, with the exception of “sounds like”, “rhymes with”, “starts with” or saying the number of letters or words. Also, avoid using gestures until the final round. Your team has to guess the same phrases as round one, but this time you can only say one word as a hint. Words like “Oh”, “Um” and gutteral noises like “ahhh” count as your word, so take a deep breath and make it count before you make a noise. In the final round, your team must once again guess the same phrases as round one and two, but this time you don’t get to say a word – just gestures. It’s like a really intense round of charades where you need to get your team to guess as many words as possible in 30 seconds. 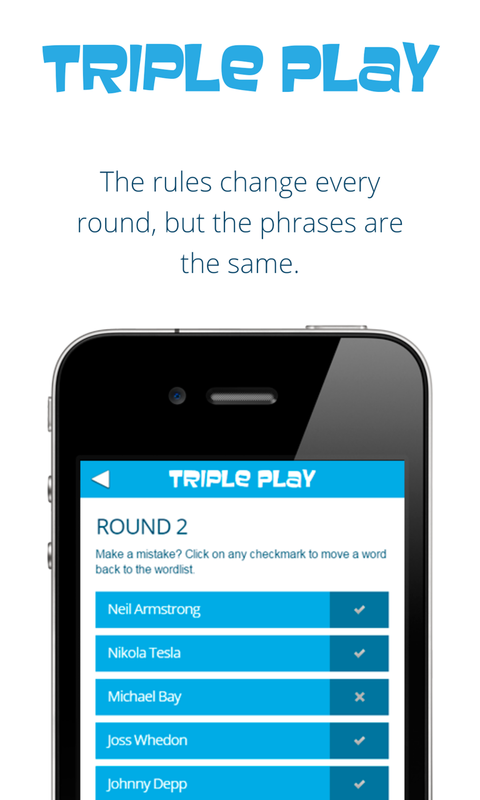 The social game comes with dictionaries to randomly choose words from or you can build your own dictionaries with friends. Included dictionaries include over 100 words and phrases each. Or purchase additional dictionaries with over 300 phrases each. 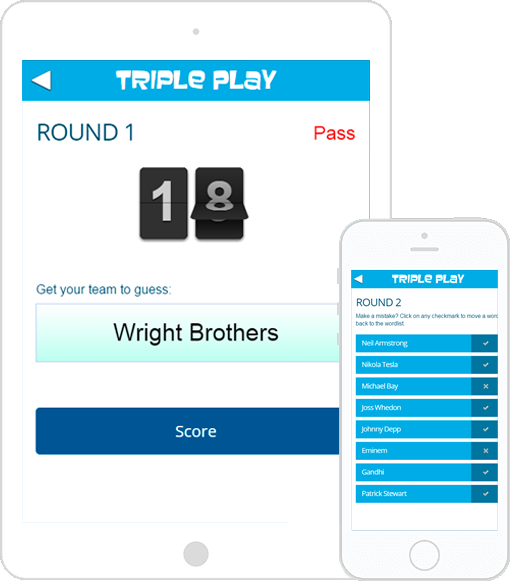 Triple Play Party is intended to be played with friends, co-workers or family members all in one place, whether it be at a home, out to lunch or at a bar. Get some friends together and split up into teams. You then can choose to have all players enter in 3 words or phrases of their choice or if you want to get started right away, select an existing dictionary. Tyler Durden,Tarzen, and Dr. Frankenstein are among the colorful and memorable characters you’ll find in the Movie Characters dictionary. For an extra challenge, try to avoid saying any actor names or movie titles. Time to hit the books! The School Terms dictionary includes subjects from elementary, middle and high school. For an extra challenge, avoid mentioning anything in the room. Presidents, activists, performers and artists are all included in this catalog of famous persons throughout history. For an extra challenge, try impersonating the person in the first round. The Technology dictionary has an array of words that involve computers, cell phones, iPods, electric cars – basically anything you can plug in. For an extra challenge, don’t say any companies or product names. Once you either select a preset dictionary or add your own words, you’re ready to begin. The game will shuffle players into an order and randomly select a team and player to go first. Whoever’s name is displayed on the Get Ready screen will pick up the phone or tablet and read the rules of the round aloud. Say one word per phrase given. Watch what you say: um, oh, uh, etc count as your one word. When the player is ready, click the Start Timer button. 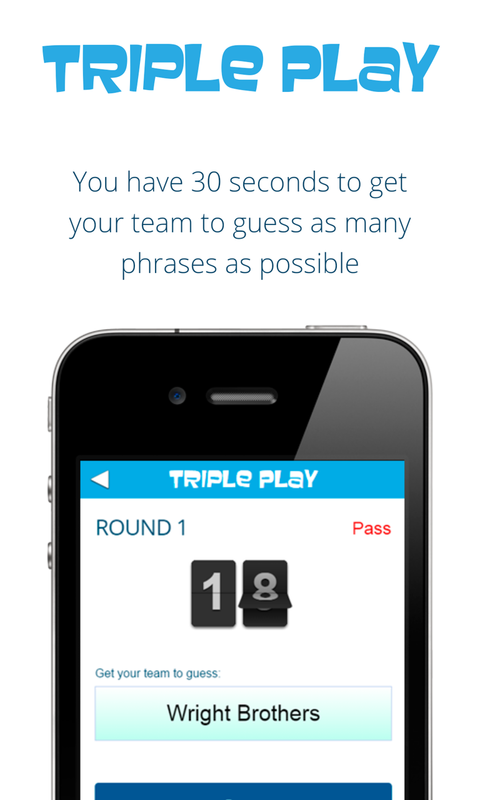 You will have 30 seconds to get your team to guess as many words as possible while abiding by the rules of the round. If a word is too tricky or you break a rule, click the Pass button – but be warned, you’ll lose 15 seconds off your time if you do. 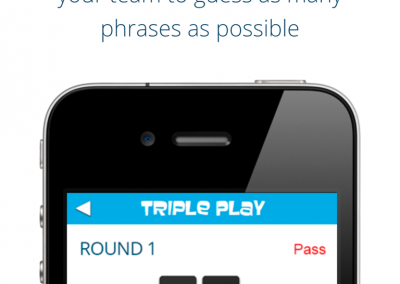 After 30 seconds, the game will show you which words you got your team to guess. Click Who’s Next to pass the game onto the other team. After all words and phrases have been guessed, the game will show the score and advance to the next round.